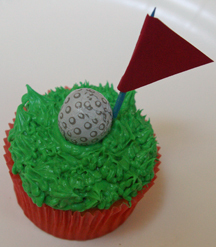 The specialty metal tip used to make the grass on this golfer cupcake is optional. You can always just use green frosting! What You Need: 1 cupcake; frosting tinted green; metal tip #233 and pastry bag; foil-wrapped golf ball chocolate; toothpick; scrap of red paper or cardstock; scissors; glue. How to Make It. 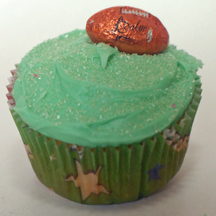 Use pastry bag and green icing to pipe grass all over surface of cupcake. (You can pipe it neatly, or more free-form, like in the example). 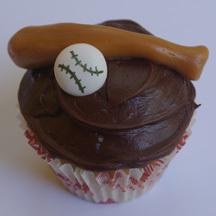 Place golf ball candy on cupcake. Cut triangle from cardstock and glue to toothpick for flag. Stick in cupcake next to golf ball. Have a sports fan in the household? Foil-wrapped chocolate balls make for quick, easy cupcakes whether you’re into soccer, football, basketball or baseball. Also great for team sports events. 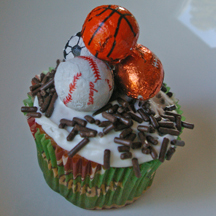 What You Need: 1 cupcake; white frosting; chocolate sprinkles; foil-wrapped chocolate sports balls. How to Make It: Frost cupcake. Add chocolate sprinkles. Stack foil-wrapped balls, using frosting to stick together if necessary. 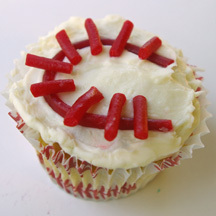 You may have seen baseball cupcakes with the stitches piped in red icing or gel. Those are fun, but what if you don’t want to haul out the pastry bag and tips, or your hand is a little unsteady? Licorice can even the score. What You Need: 1 cupcake; white or off-white frosting; red string licorice (such as Twizzlers Pull-N-Peel); scissors. 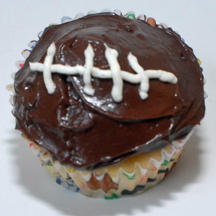 EasyCupcakes.com has featured several football cupcakes suitable for Super Bowl parties and other events. 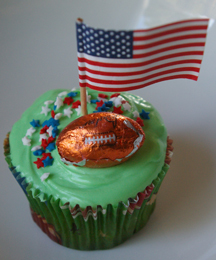 But if your treats to come together as quickly as possible (in other words, you’re punting), try these easy Super Bowl cupcakes. There’s no piping at all, just sprinkle and party on! What You Need: 1 cupcake; green icing (pretinted, or use food coloring); green sugar or sprinkles; foil-wrapped football chocolate candy. How to Make It: Frost cupcake. Sprinkle with green sugar for grass. Add football candy.